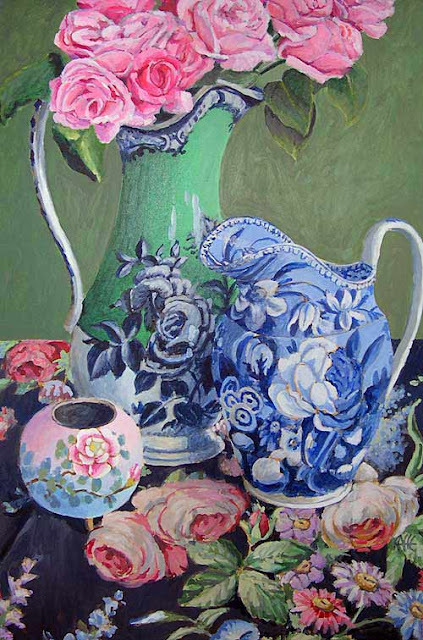 As a 'thank you' for all your good wishes, I'm sharing one of my favorite contemporary artists with you today. 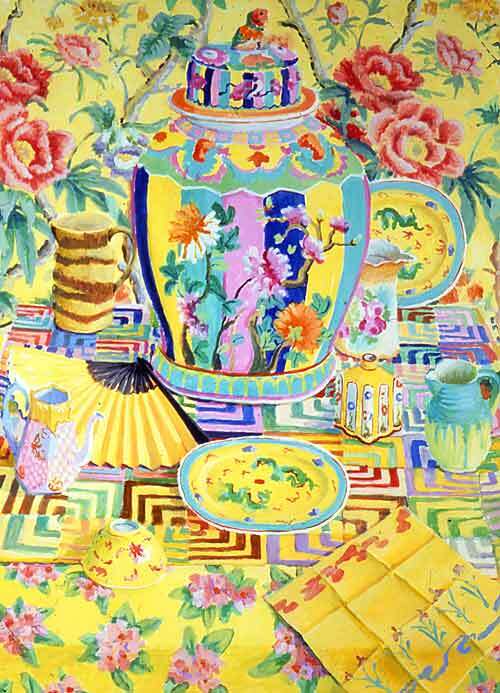 Kaffe Fassett (1937 - ) is a prolific, incredibly talented, American artist primarily known for his festive fabric, quilting, knitting and needlepoint designs. This chair is a work of art in itself. 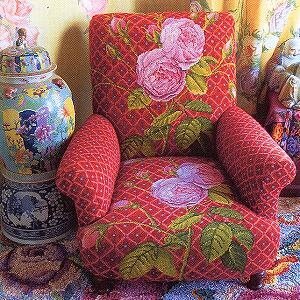 But if I had to choose, I'd say it is his paintings I love most, though that chair covered in his needlepoint design does take my breath away. Gorgeous Kaffe Fassett fabric design. Only one of many books devoted to Fassett's designs. To learn more about Kaffe Fassett's life and work, please use this link to his website. I've culled these examples of Kaffe Fassett's work from various online sources for our educational enlightenment. We love the bold use of colour in Kaffe Fassett's designs. We think that they work particularly well with textiles when one has the texture of the material to also add to the overall creative and artistic experience of it all. 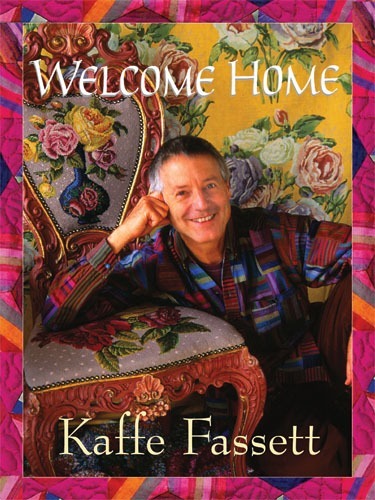 We have always marvelled at those people, and Kaffe Fassett is indeed a master, who can layer pattern upon pattern and yet it always seems so perfectly right. We certainly do not possess such a magic touch! I have some of his knitting patterns tucked away somewhere - a bit flamboyant for me as apparel but I love his needlepoint designs to bits! Jane and Lance, it's a gift - no question. 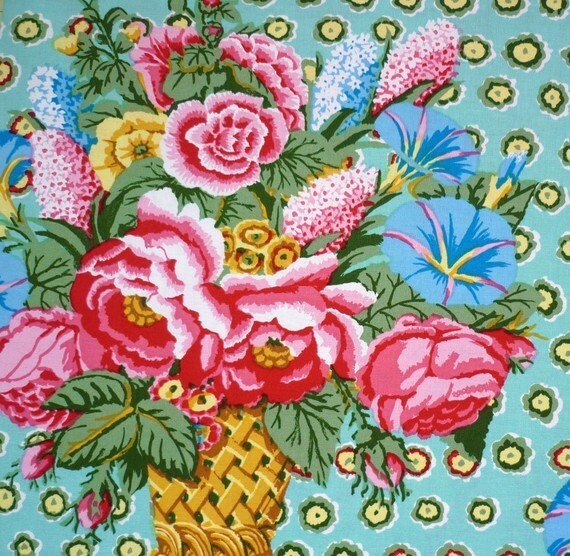 I love pattern upon pattern, but my efforts come nowhere near the brilliance of Kaffe Fassett. He is a master. You're welcome, Sue. I love Fassett's work. I've just recently discovered him and was bowled over. Yvette, I can't believe these are painted on fabric. 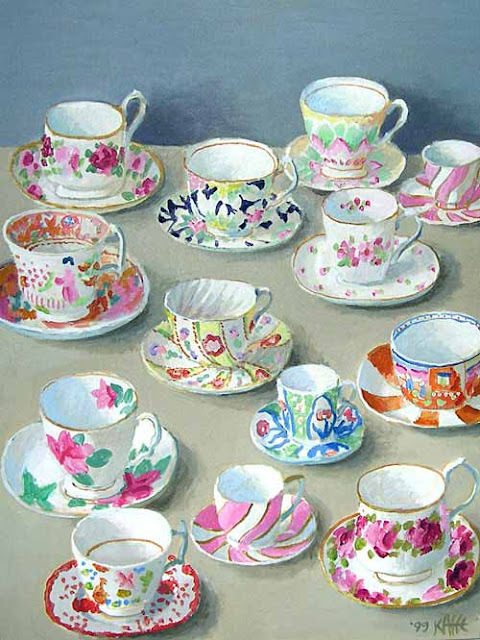 The "13 cup saucers" (if I may) is really lovely. Thanks for sharing Kaffe Hassett's work as well as that of Adriaen van de Venne whose horse-driven carriage painting is among the best I have seen in recent times — very realistic. Enlarging the paintings does make all the difference. Oh you have to enlarge them, Prashant. They appear so tiny on the blog. You can't fully appreciate them. 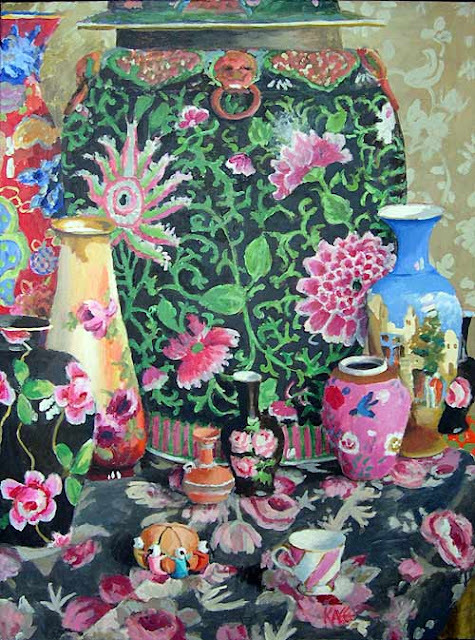 I don't think Kaffe Fassett's paintings are done on fabric, though. I'm sorry if I caused any misunderstanding. These are beautiful paintings and fabrics. Kaffe Hassett is so creative. I usually don't like "busy" patterns, except for Matisse's works, but these I like. 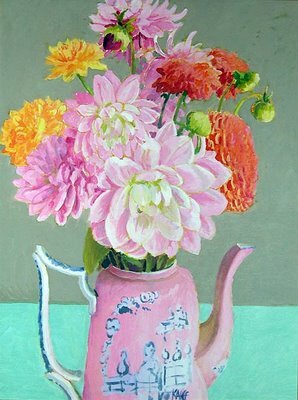 Kathy I too love Matisse and I love Kaffe Fassett. Both are/were geniuses in my book. 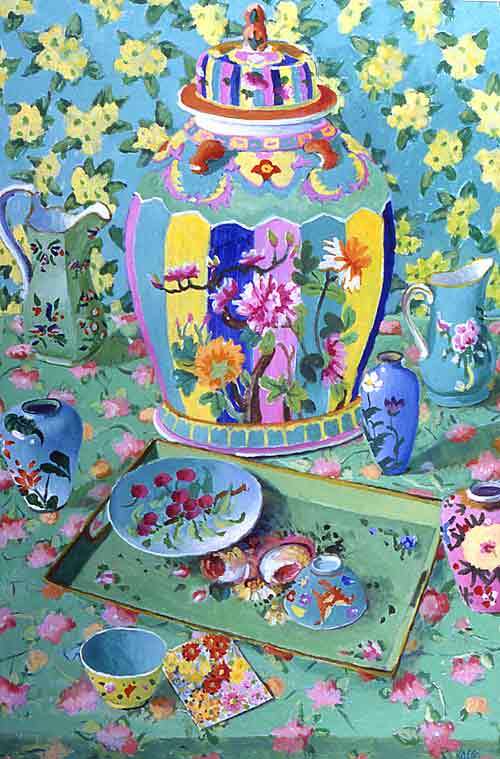 If I had the dough I'd buy one of Kaffe Fassett's original paintings. The Scallop shell design is one of mine not by Kaffe. I'm sorry for the misattribution. I deleted the design from the post. I do try and double-check everything I post, but sometimes things get by me. Again, apologies and thanks for letting me know.